If you're from Minnesota or you know someone from here, you know how important the sport of hockey is to our State. It's our baby and probably born from the extended winters we have here. We like to have fun and competition even in the harshest winters and that's reflected in our great hockey tradition. Although wildlife art is our specialty, there's another genre which we take a lot of pride in carrying, the sports artist. Terrence Fogarty hockey prints capture the feelings of our sport from early childhood to the great Uinversity teams of the past and the Olympics. This artist brings out those feelings or youthful days that we treasure so much and we feature here on our web site or you can check out a video interview with the artist exclusively from Art Barbarians (32MB). We have a couple of examples of this fine artist's work. You get a sense of perspective in his art and an excellent color representation that is deep and rich. 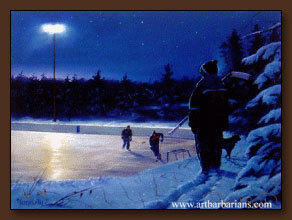 Another one of the great Terrence Fogarty hockey prints is the picture at right which is titled "Late Skate". This image gives the feeling of the dedication, the discipline of the ice. It looks so much like the Midwest and you can almost smell the fresh, cold air just as the subjects of this great print did. Call us if you have any questions about anything you see on our web site or need to know more about Terrence Fogarty hockey prints. We're happy to answer your questions personally regarding availability or something special you're looking for.